Melanie Patenaude serves for the Leathernecks. 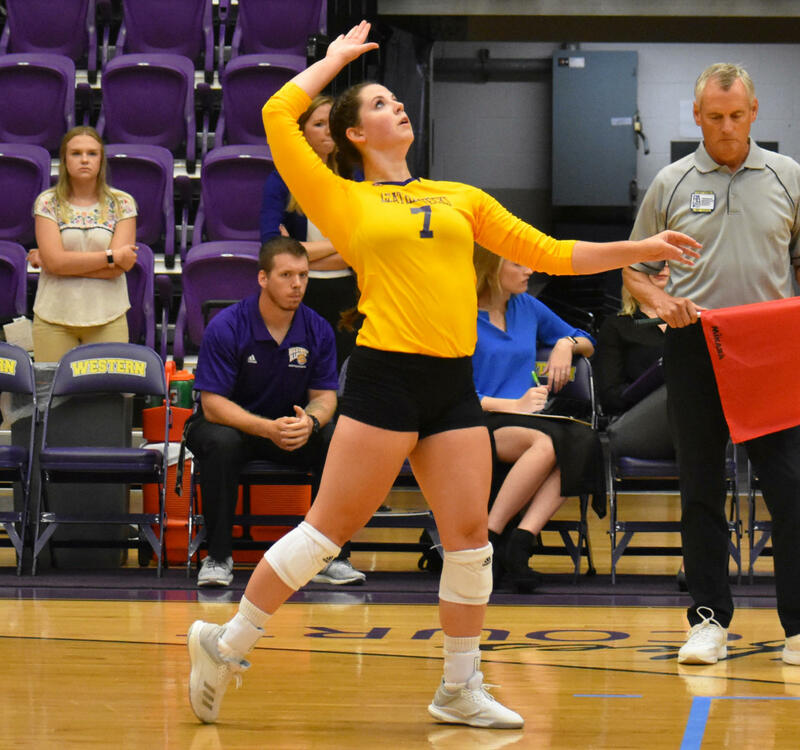 PEORIA, Ill. — The Western Illinois University women’s volleyball team will travel to Peoria, Ill. this upcoming weekend to participate in the Bradley University Tournament. The tournament will consist of three games over the course of the weekend, played against Bradley University, George Washington University and The University of Toledo. The Leathernecks are looking to improve upon their previous weekend of play, striving to achieve a positive record during this upcoming weekend. Going into the weekend with a 1-2 overall record, it is possible for the Purple and Gold to come out of this weekend with an overall positive record. Currently leading the Leathernecks defensively, senior outside-hitter Melanie Patenaude leads the team in kills, earning 38 kills for the Leathernecks so far, averaging 3.17 kills per set. Following Patenaude, sophomore outside-hitter Emma Norris has earned a total of 26 kills for Western, averaging 2.36 kills per set. Senior right-side-hitter Shiah Sanders comes in closely behind Norris with 23 kills this season, averaging 1.92 kills per set. Senior setter Jaime Johnson currently leads the Leathernecks in assists, having earned 82 assists so far this season. Following Johnson is sophomore setter Cassie Hunt who has earned 32 assists. Defensively, the Leathernecks are being led by junior libero Claire Grove who has earned 48 digs this season so far. Johnson follows closely behind Grove with a total of 32 digs. Patenaude has also shined defensively this season, coming in with 22 digs for the Leathernecks. At the net, redshirt-sophomore hitter Mackenzie Steckler and junior-hitter Riley Schumacher both lead the Leathernecks with 15 blocks so far this season. Closely following Steckler and Schumacher is Sanders with a total of 11 blocks. Patenaude currently leads the Leathernecks with a eight service aces this season. 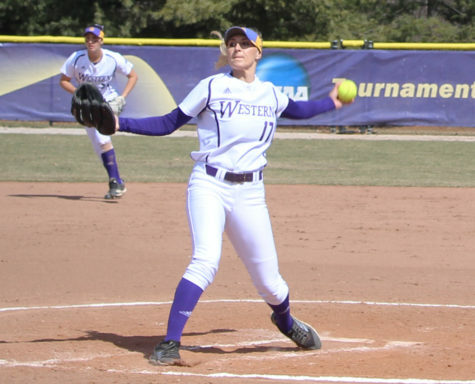 The Leathernecks are scheduled to play against Bradley University on Friday at 6 p.m. Bradley University currently has a 2-1 record, putting them just ahead of Western coming into Friday’s matchup. The Leathernecks are playing BU on their home turf, which means that the Purple and Gold have to come out strong early in the match in order to overcome any Bradley home-court advantages. Following their matchup against Bradley University, the Leathernecks are scheduled to face off against George Washington University on Saturday 1 p.m. The Colonials currently have a 0-2 record, meaning that the Leathernecks will have a slight advantage coming into Saturday afternoon’s matchup. For the third and final match of the Bradley University Tournament, the Leathernecks will play the University of Toledo at 5 p.m. The Toledo Rockets are currently 0-3 this season so far, putting them behind the Leathernecks who stand at 1-2 for their overall record. The Western Illinois University women’s volleyball team looks to improve upon their record during this upcoming tournament. The Leathernecks have been working hard on maintaining their energy on the court as well as fixing mistakes from their previous games, making this upcoming weekend an opportunity to display the results of their work. 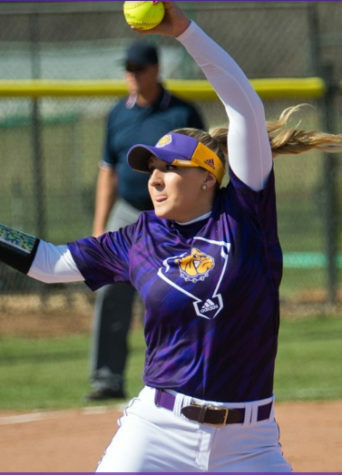 The Purple and Gold strive to perform well during the Bradley University Tournament. They plan to make strides towards earning a positive overall record as well as improving their gameplay in preparation for their quickly approaching conference matches.